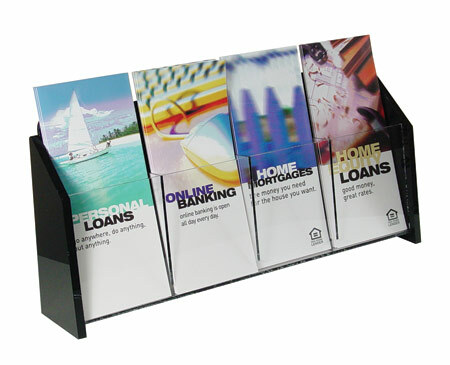 3-pocket all clear acrylic wall brochure holder for 4"w brochures, pamphlets and other take-away literature. Made from quality clear acrylic with polished edges. 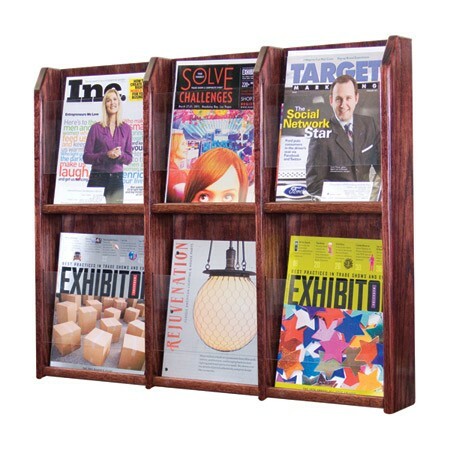 This literature holder is ideal for customer service windows, waiting areas, offices, and lobbies. Overall dimensions: 13"w x 6"h x 2"d.
A clear acrylic rate display or poster holder and an adjustable 5-pocket literature dispenser. Adjustable "peg" divider pockets attach securely to the poster frame with two post screws (included). Available in 2 sizes! Shown in 22x28 Custom Sizes available. Please call for details. 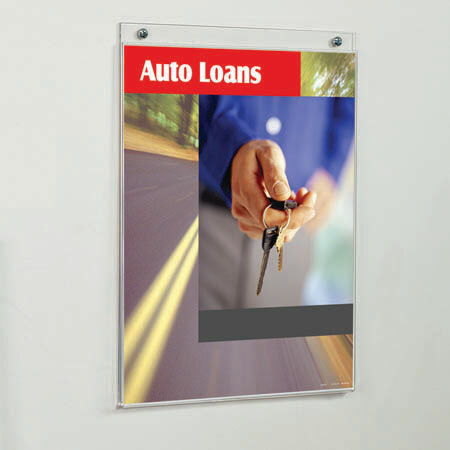 This wall mounted acrylic sign holder is the perfect place to display signage, notices and other important information, as well as providing take-away literature. 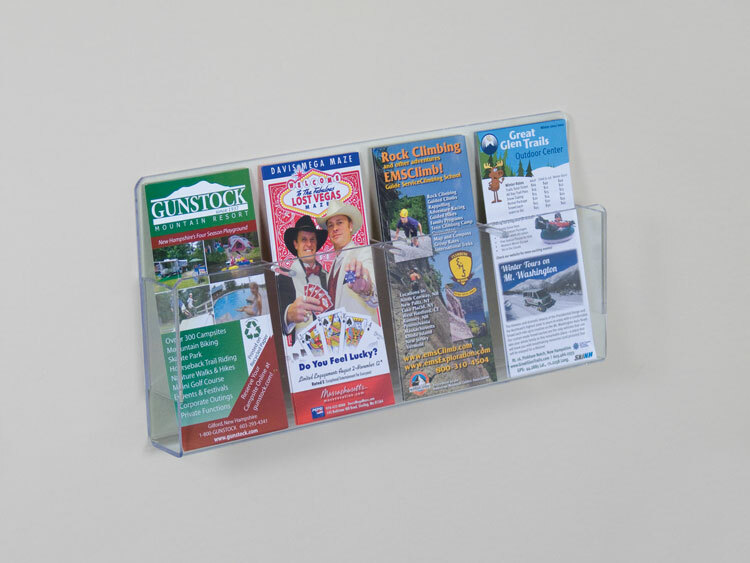 The sign holder can accommodate 8.5"x11" inserts and features a single pocket brochure holder for standard 4"wx9"h brochures. Made in the USA! This 14"w x 11"h non-glare display has accent strips for a modern look. The accent strips hide magnets which attach to the metal backer. Slip in a sign of your choice (sold separately) for a sleek modern display. 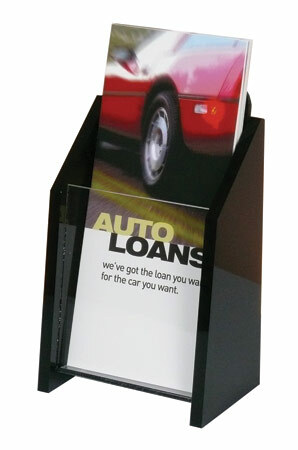 Display brochures for customers in the attached brochure holder. Holds 14"w x 11"h insert. Visible Area: 9"w x 11"h Silver frame with brushed silver accent pieces. 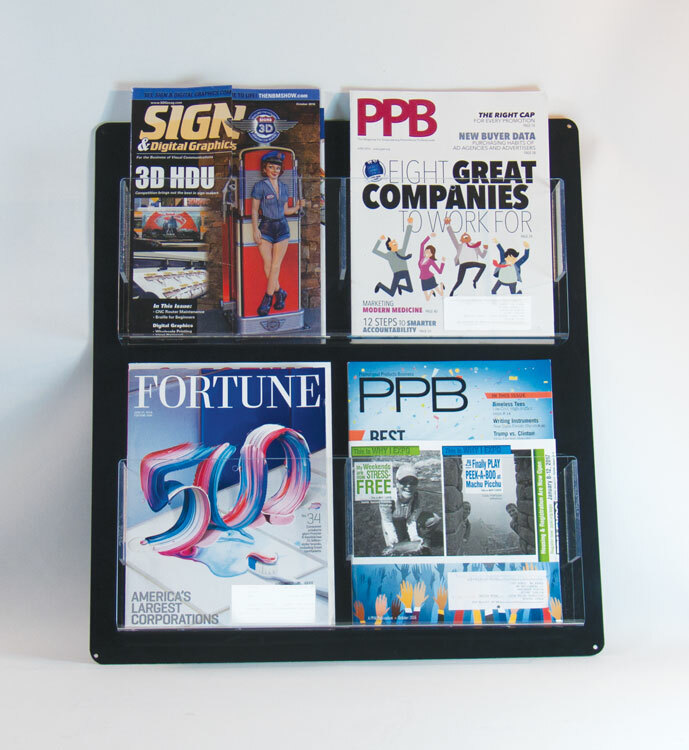 This acrylic brochure rack combines clear acrylic front pockets with handcrafted 3/8" thick black polished acrylic end caps. Comes complete with mounting hardware. 2-tiers & 10-pockets. Measures 21-3/4"w x 7-1/4"h & holds 4"w x 9"h brochures. * Elegant hand crafted design is great where image counts. 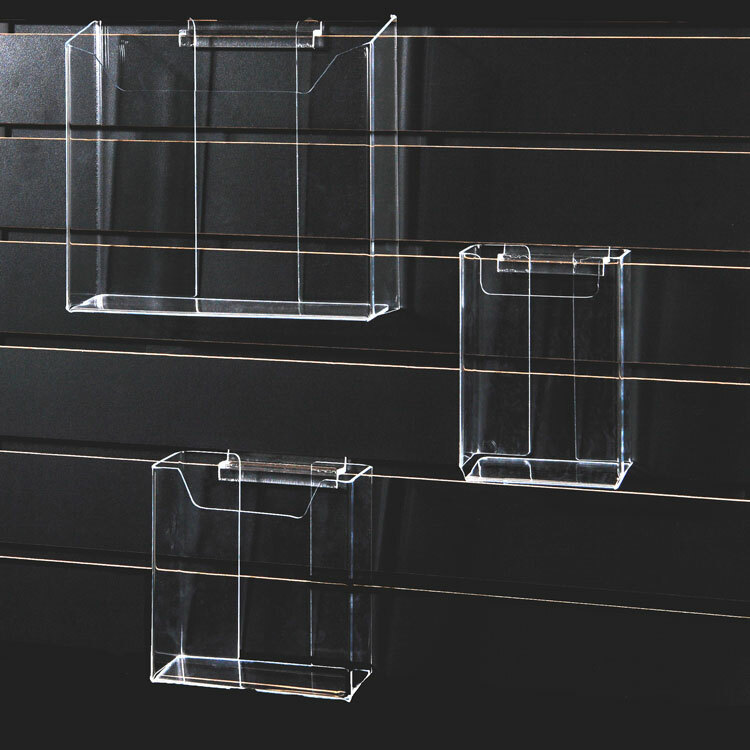 * Highly polished 3/8" thick black acrylic sides w/ 4"x9" crystal clear acrylic pockets. * 2" deep pockets. 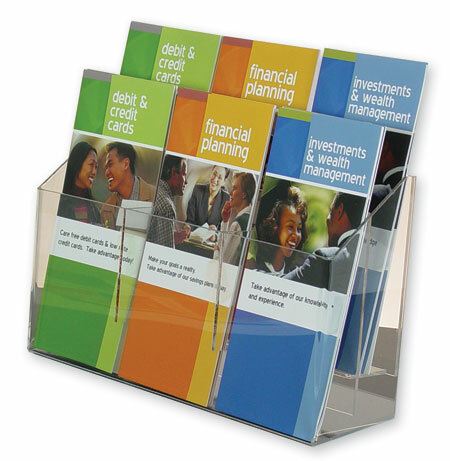 This acrylic brochure rack combines clear acrylic front pockets with handcrafted 3/8" thick black polished acrylic end caps. Comes complete with mounting hardware. 1-tier & 4-pockets. Measures 17-5/8"w x 5-1/4"h & holds 4"w x 9"h brochures. * Elegant hand crafted design is great where image counts. * Highly polished 3/8" thick black acrylic sides w/ 4"x9" crystal clear acrylic pockets. * 2" deep pockets. 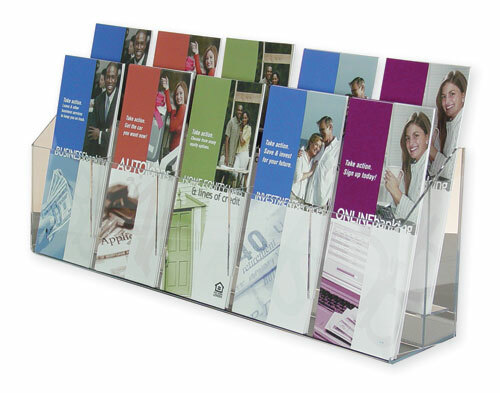 Clear 1/8" thick acrylic multi-pocket "tiered" brochure holders for displaying standard size 4" x 9" brochures. Efficient space saving design for minimal counter space. Rounded polished edges. Measures: 21.75"w x 7.25"h.
Clear 1/8" thick acrylic multi-pocket "tiered" brochure holders for displaying standard size 4" x 9" brochures. Efficient space saving design for minimal counter space. Rounded polished edges. Measures: 13"w x 7"h x 4-1/2"d.
Clear 1/8" thick acrylic multi-pocket "tiered" brochure holders for displaying standard size 4" x 9" brochures. Efficient space saving design for minimal counter space. Rounded polished edges. 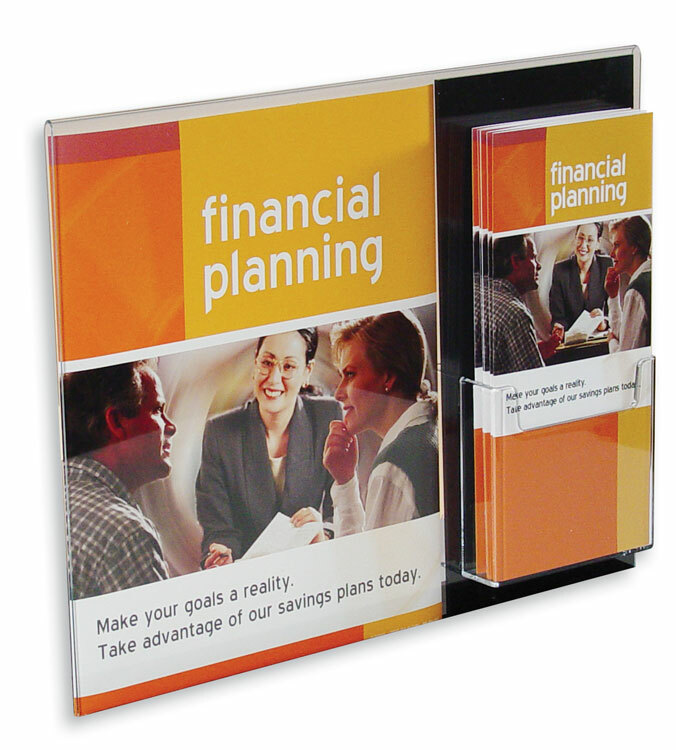 Measures: 17.5"w x 7.25"h.
Single pocket brochure holder add-ons come in 4 1/8" or 5 1/2" widths. Single pocket literature holder add-on is 8 5/8" wide for letter-size materials. These are a great way to customize your slatwall displays! 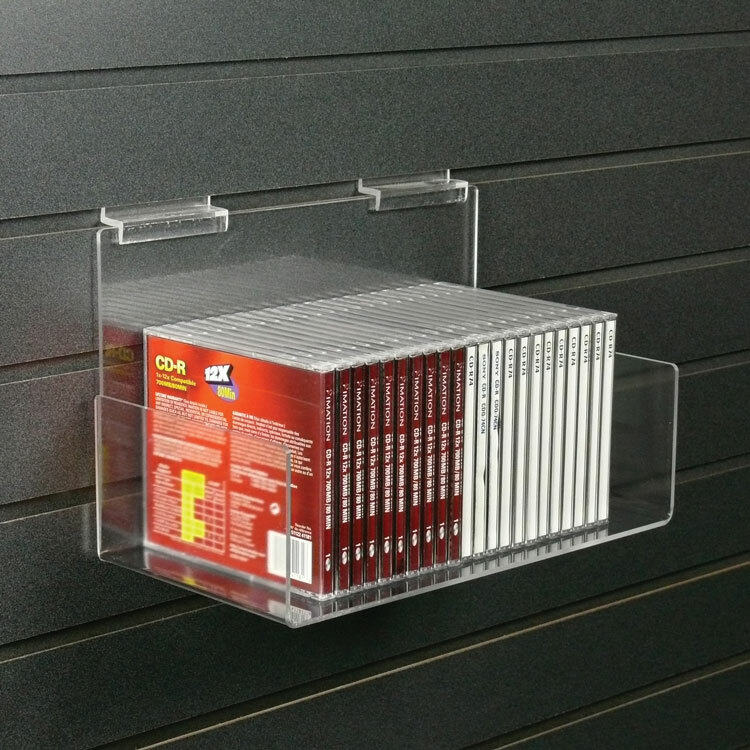 Clear acrylic slatwall shelf is perfect for displaying cd's, dvd's and other merchandise on your slatwall display. Made from high quality polished clear acrylic. 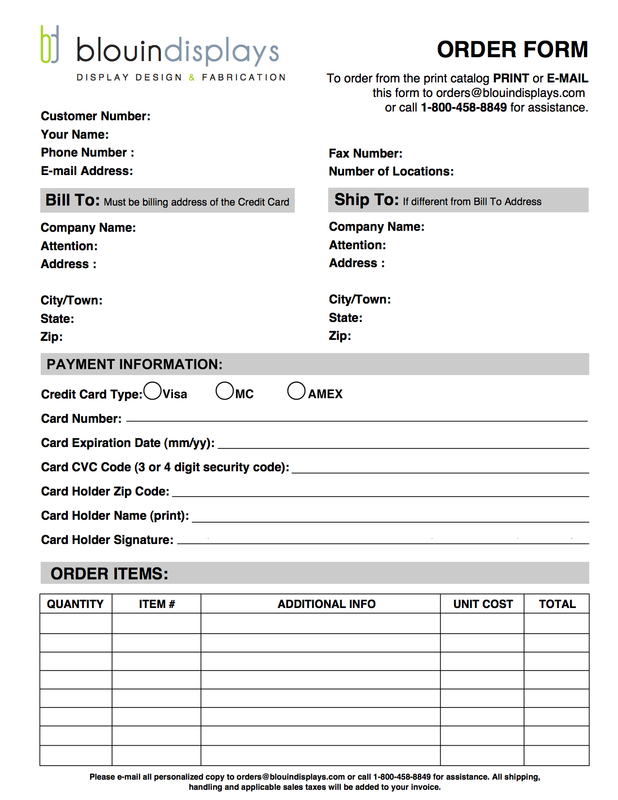 Overall dimensions: 10"w x 4"h x 6"d Custom imprinting available - call today for details! 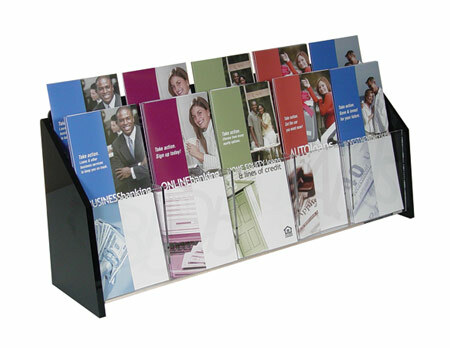 Acrylic wall brochure holder with 4-pockets for 4"w brochures and other sales/marketing literature. Made from quality clear acrylic with polished edges. 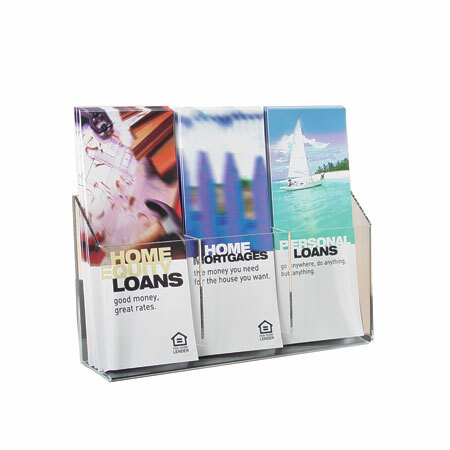 This brochure holder is a perfect for showcasing your handouts. 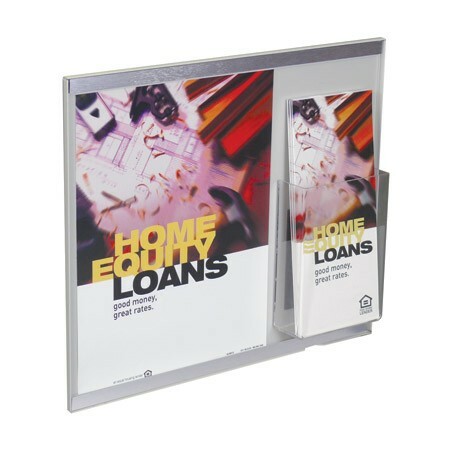 Overall dimensions: 17"w x 6"h x 3-1/2"d.
This 4 pocket mounted acrylic sign holder is perfect for displaying brochures, pamphlets, leaflets, and more in an organized manner! Ideal for marketing and sales materials. 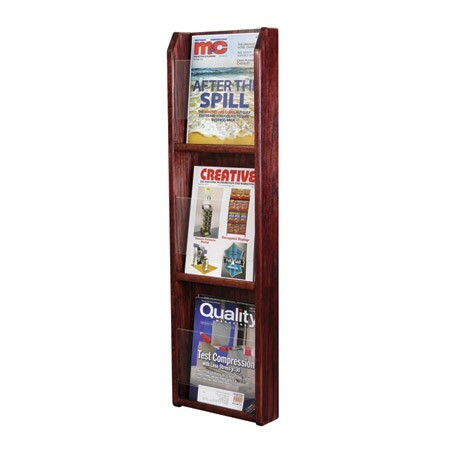 This convenient holder is designed to fit standard 4"w x 9"h literature to 8.5"w x 11"h materials. 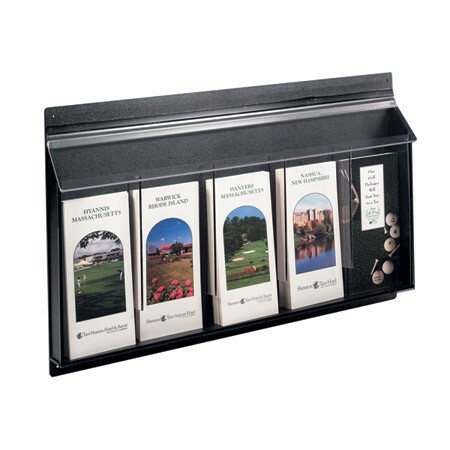 Use this Single Pocket Literature Holder to display brochures, pamphlets, leaflets, and more in an organized manner! Ideal for marketing and sales materials. - Designed to fit up to 4"w x 9"h materials - Pocket is 1.25" deep - Precision cut from black and clear acrylic and bent to shape - Made in the USA! Custom sizes and imprinting available - Call today! 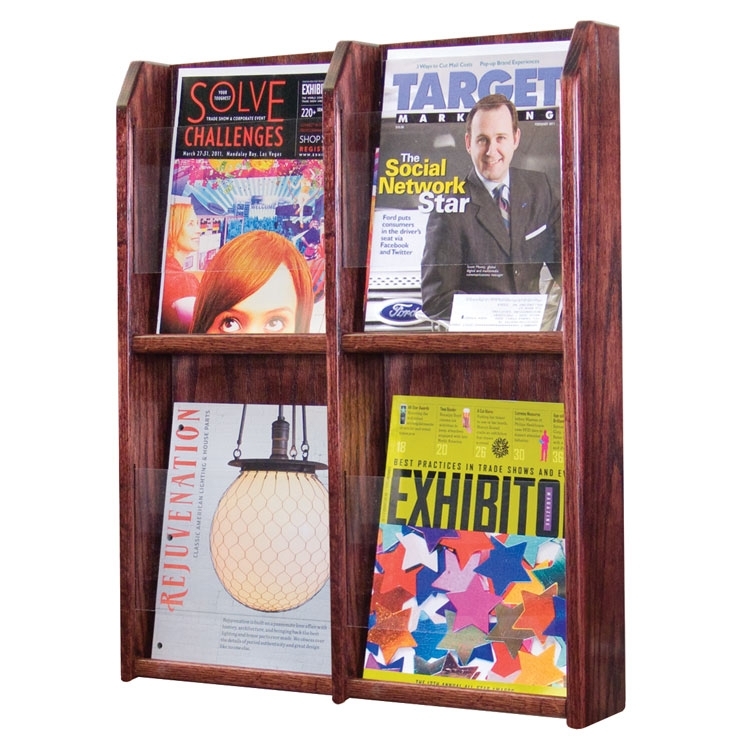 Wall mounted racks add warmth to any room while displaying magazines and literature. Wall racks are constructed with solid oak sides and dividers with oak veneer backs. 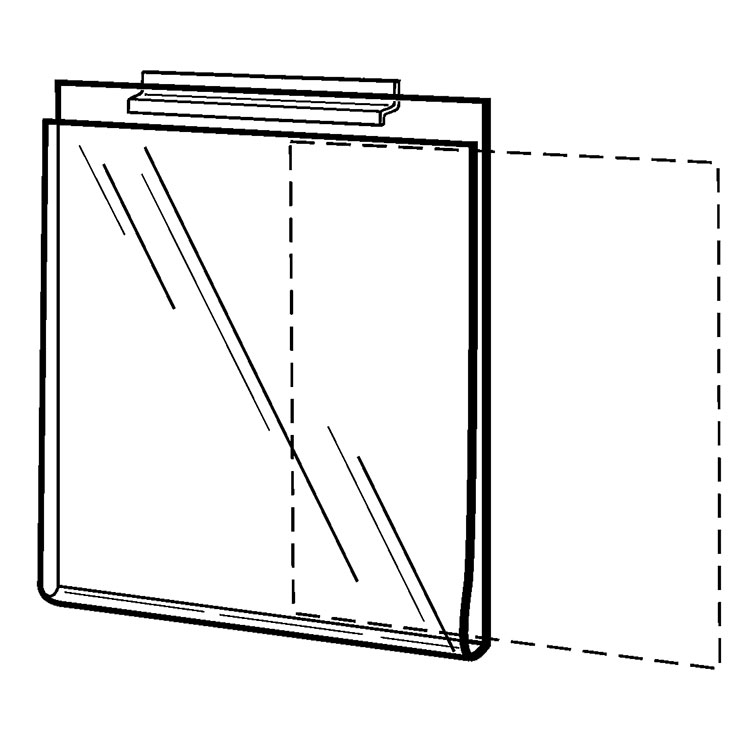 The clear acrylic panels hold literature neatly in place. The pockets are 9" wide and 2" deep. 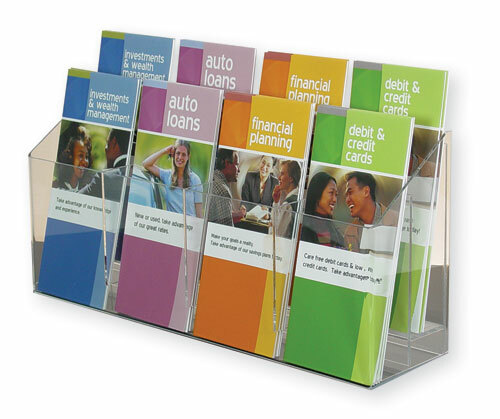 Optional removable plastic dividers are available which are used when displaying 4" brochures. All racks are pre-drilled with screws and hardware included for simple wall mounting. 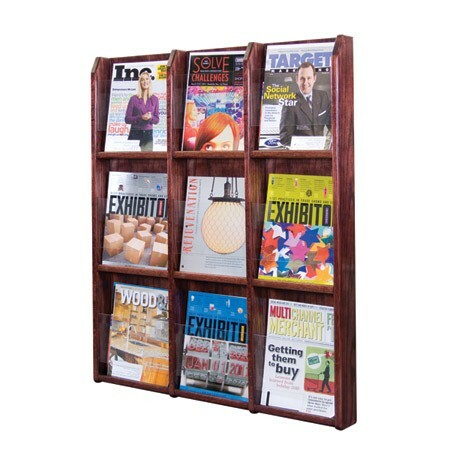 Use this 24 Pocket Literature Holder to display brochures, pamphlets, leaflets, magazines, catalogs and more all in one location! 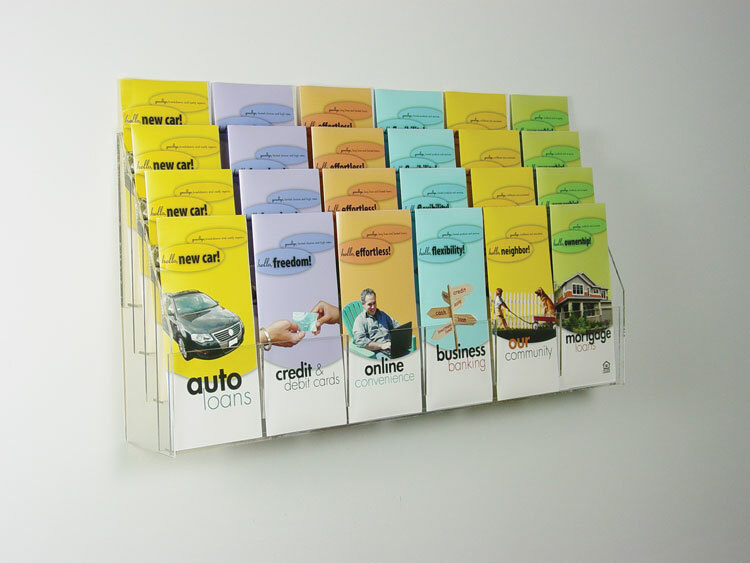 Ideal for marketing and sales materials where counter space is sparse. The tiered style maximizes your advertising capability without taking up too much wall space.